Root canal treatment (Endodontics), is a dental procedure where the centre of a tooth (the dental pulp) is cleaned out and replaced with filling material to leave a root-filling. It is required when the pulp becomes infected or the nerve within the pulp dies – this most commonly happens as a result of dental decay, trauma to the tooth or by having a very large filling on a tooth for a long period of time. 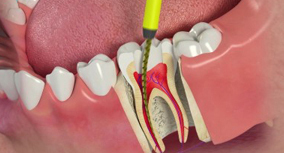 The alternative to root canal treatment is to have to tooth extracted. Is the bad reputation of root canal treatment deserved? Will I need further treatment on the tooth afterwards? A tooth that has broken badly, leaving little remaining tooth above the gum. 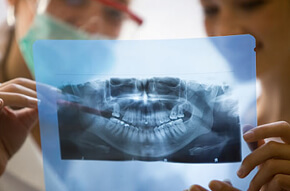 Root canal treatment should not be the painful, dreaded experience that many people fear. Whilst it can be a technically demanding procedure and one that carries no absolute guarantees of longterm success, advances in technique and technology have resulted in improved success rates and is usually a viable alternative to extraction. Your Smilemakers' dentist will usually be able to carry out the root canal treatment but sometimes a referral to a Specialist (an Endodontist) may be required. The clinical time and modern rotary equipment required to provide a high quality root-filling usually results in a cost to the patient of a few hundred pounds. The cost of saving a tooth with root canal treatment is usually less than the cost of replacing the tooth with a bridge or implant. Due to the invasive nature of root canal treatment, your dentist will often recommend crowning the tooth afterwards to protect the root canal and the remaining tooth, and therefore the cost of this may need to be factored into your treatment plan.